Animation by Alexander Vorobiov from Dmytro Sukholytkyy-Sobchuk's "Krasna Malank," one of 16 films being shown at the Museum of the Moving Image this weekend during the Rural Route Film Festival. ASTORIA — Get a taste of pagan culture at this year's Rural Route Film Festival, which kicks off this weekend with live music and food. The Rural Route Film Festival — created to highlight films about people and places outside of the city — will feature international films with a pagan theme this year at the Museum of the Moving Image from Aug. 8-10. "It's so interesting how it comes together every year," said filmmaker and festival director Alan Webber. "We've really got a cool, unique program." The lineup includes 16 films, including a Ukranian love story called "Shadows of Forgotten Ancestors," which is set in the Carpathian mountains in the 19th century and features elements of mythology and "pagan magic," the organizer said in a written statement. The screening takes place on Friday and will be followed by a vodka reception, according to the organizer. 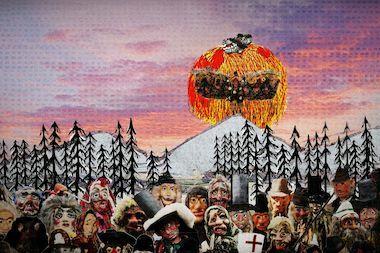 Other films in the lineup include the North American premiere of Dmytro Sukholytkyy-Sobchuk's "Krasna Malanka," which is set in the Ukraine during a pagan holiday, and the 1973 cult-classic "The Wicker Man," the organizer said. In addition to the screenings, live music and food from local restaurants will be served in the museum's courtyard on Saturday and Sunday, including dishes from Long Island City's Bear and William Hallet. The festival will wrap up on Sunday with a closing party at the rooftop farm Brooklyn Grange at 37-18 Northern Blvd. with additional screenings, live music, food and drink. Tickets for the screenings at the Museum of the Moving Image are $10 to the public and free for museum members. They can be bought online here, and tickets for the closing night at Brooklyn Grange can be purchased here.